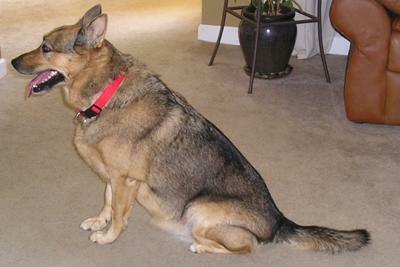 Do you think my dog is a Sable German Shepherd? I rescued Bailey about 8 years ago. (she was approx 2 yrs) She was to be put to sleep that day b/c she wasn't manageable they told me. I took her and she has been a great dog since. No aggression, no chewing, no accident's, loves kids. She herds all the dogs at the park. She blow's her coat twice a year, which is a real pain, but she's well worth it. She does have a small black spot on her tongue,which made me assume she was Chow. I thought she was German Shepherd mixed with maybe Chow. Then I saw a dog at the store today that looked exactly like my Bailey. They told me he was a Sable German Shepherd. Now I want to know what you think. Congratulations on rescuing your beautiful Bailey! Looks like things worked out well for you both and I wish more people would follow your lead and do dog rescues too. She is a gorgeous young lady at the ripe old age of 10 too! And yes, based on her beautiful coloration, you're right, she is a gorgeous sable German Shepherd - or at least a sable German Shepherd mix. Thanks for sharing your story and her lovely photo too with us. If you don't mind me offering a bit of friendly advice, I would encourage you to help her lose a little weight though - it'll make it so much easier for her to get around - especially at her age. Good luck with your girl!